I’m kinda proud of this one. Two days ago, in the lull between storms full of ice and rain, the sky was — majestic over our little village of Berwyn. If you click on the picture and go to flickr, and then select the “original” size, you can see icicles on the branches of the trees. No cropping was done, just a bit of adjustment to the tone and clarity. It was a freaky day. This entry was posted on Sunday, December 16th, 2007 at 10:47 pm	and tagged with clouds, photography, sky, trees and posted in Uncategorized. You can follow any responses to this entry through the RSS 2.0 feed. 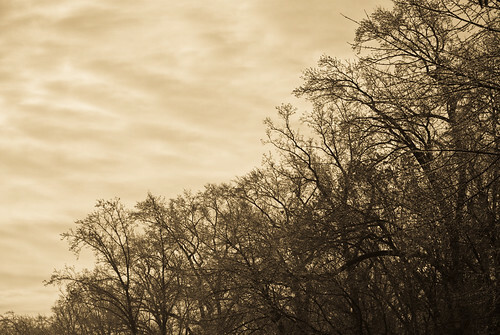 I love that sort of sepia tone and the way the clouds seem to flow right out of the ends of the branches. Lovely!